Zephyr male hex drive nutsetters allow nutrunning in all types of applications. Zephyr nutsetters feature a quality design and are constructed to give Zephyr nutsetters a long service life, durability and eliminate time-wasting motions when starting fasteners or working in hard-to-reach areas. Zephyr magnetic nutsetter, 1/4'' male hex power shank, 1/4'' hex opening, type 1, 1 3/4'' overall length. Zephyr magnetic nutsetter, 1/4'' male hex power shank, 3/8'' hex opening, type 1, 1 3/4'' overall length. Zephyr magnetic nutsetter, 1/4'' male hex power shank, 5/16'' hex opening, type 1, 1 3/4'' overall length. Zephyr magnetic nutsetter, 1/4'' male hex power shank, 7/16'' hex opening, type 1, 1 3/4'' overall length. Zephyr magnetic nutsetter, 1/4'' male hex power shank, 1/4'' hex opening, type 1, 2 9/16'' overall length. Zephyr magnetic nutsetter, 1/4'' male hex power shank, 3/8'' hex opening, type 1, 2 9/16'' overall length. Zephyr magnetic nutsetter, 1/4'' male hex power shank, 5/16'' hex opening, type 1, 2 9/16'' overall length. Zephyr magnetic nutsetter, 1/4'' male hex power shank, 7/16'' hex opening, type 1, 2 9/16'' overall length. Zephyr magnetic nutsetter, 1/4'' male hex insert shank, 1/4'' hex opening, type 2, 1 3/4'' overall length. Zephyr magnetic nutsetter, 1/4'' male hex insert shank, 3/8'' hex opening, type 2, 1 3/4'' overall length. Zephyr magnetic nutsetter, 1/4'' male hex insert shank, 5/16'' hex opening, type 2, 1 3/4'' overall length. 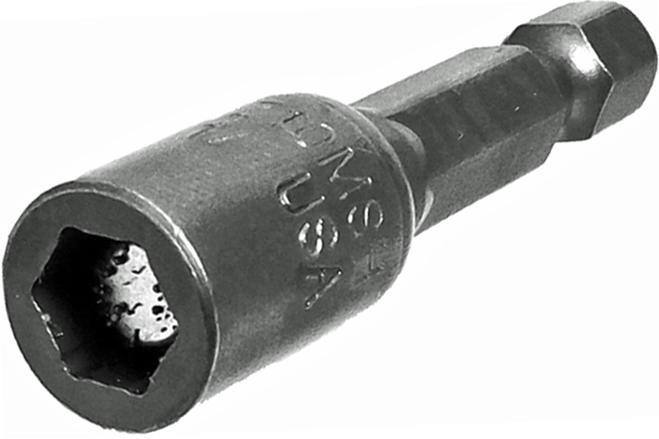 Zephyr non-magnetic nutsetter, 1/4'' male hex power shank, 1/4'' hex opening, type 1, 1 3/4'' overall length. Zephyr non-magnetic nutsetter, 1/4'' male hex power shank, 3/8'' hex opening, type 1, 1 3/4'' overall length. Zephyr non-magnetic nutsetter, 1/4'' male hex power shank, 5/16'' hex opening, type 1, 1 3/4'' overall length. Zephyr non-magnetic nutsetter, 1/4'' male hex power shank, 1/4'' hex opening, type 1, 2 9/16'' overall length. Zephyr Non-Magnetic nutsetter, 1/4'' Male Power Shank, 3/8'' Hex Opening, Type 1, 2 9/16'' overall length. Zephyr Non-Magnetic nutsetter, 1/4'' Male Power Shank, 5/16'' Hex Opening, Type 1, 2 9/16'' overall length. The Z10SH-1/4 Zephyr Non-Magnetic Nutsetter, 1/4'' Male Power Shank is one of thousands of quality tooling products available from MRO Tools. Please browse Zephyr Nutsetters for tools similar to the Z10SH-1/4 Zephyr Non-Magnetic Nutsetter, 1/4'' Male Power Shank. Z10SH-1/4 Zephyr Non-Magnetic Nutsetter, 1/4'' Male Power Shank description summary: Zephyr non-magnetic nutsetter, 1/4'' male hex power shank, 1/4'' hex opening, type 1, 1 3/4'' overall length. Quantity discounts may be available for the Z10SH-1/4 Zephyr Non-Magnetic Nutsetter, 1/4'' Male Power Shank. Please contact MRO Tools for details.